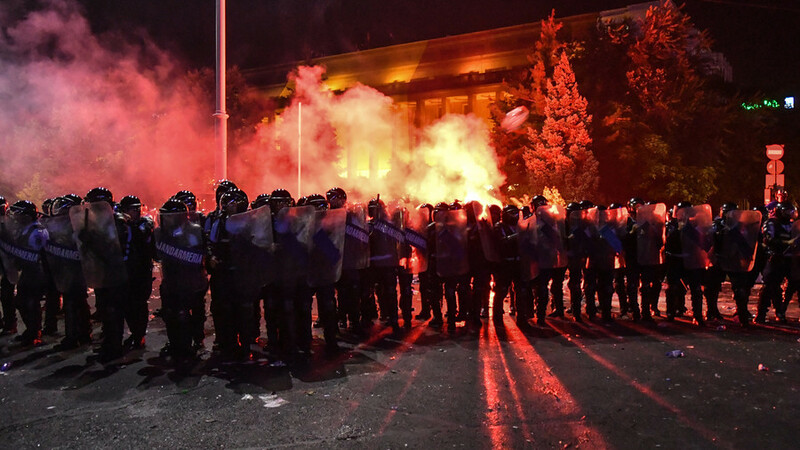 Hundreds of people have been injured after a massive anti-corruption rally in Bucharest, spearheaded by expats calling on the government to resign, turned violent, forcing riot police to use water cannons and tear gas. Bucharest’s Victoriei Square became a scene of violent clashes with police warning the protesters in advance that they would not tolerate disorder. Despite the warnings, several groups of protesters calling for the resignation of the Social Democrat Party-led government tried to break through a security line. Police responded by firing tear gas and deployed water cannons against the crowd. At least 440 people, including 24 gendarmes, received medical treatment after being injured in the rally, authorities said. At least 65 people were transported to hospital, nine of whom were gendarmes. What eventually grew into a massive, 60,000-strong rally began at noon, when roughly 200 expats gathered to protest corruption, low wages and attempts by the PSD to weaken the judiciary. Initiated by diaspora associations, Romanians living abroad waved the national tricolor and EU flags and chanted slogans against the government and the Social Democratic Party (PSD), such as 'Down PSD! ', 'Thieves!' and 'Resign!' They also held banners reading 'Citizens have the right and duty to defend Romania', and 'No: Corrupt Romania, Corrupt MPs'. At 5:00 pm the rally officially took off under the careful watch of authorities. At least 30 ambulances, three emergency services motorcycles and 13 fire engines were deployed for Friday’s rally. 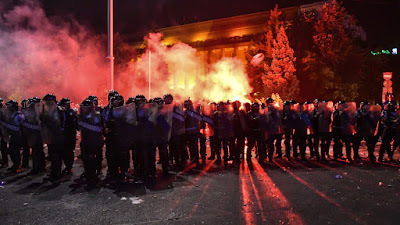 Before authorities moved in to curb the unrest, the head of the Romanian Gendarmerie Service, Marius Militaru, urged all women and children to leave, warning that provocateurs might use them “as a shield to protect themselves.” Militaru noted that the violent crowd threw bottles and pieces of asphalt at police lines. Law enforcement pushed the crowd from the square to adjacent streets. While most activists went home, a few pockets of rowdy protesters continued to engage the police into the night.